Penn National Race Course in Grantville, Pa. Veteran Penn National trainers John D. Conner and Bruce M. Kravets await Nov. 15 preliminary hearings in Commonwealth of Pennsylvania court on charges of “rigging a publicly exhibited contest.” The two men are the latest to be swept up in a long-running investigation of medication practices by equine veterinarians and trainers at the Grantville, Pa., racetrack and casino. According to the Patriot-News of Harrisburg, Pa., Kravets is accused of giving estrogen adrenal cortex to horses close to a race. The newspaper's website said Conner gave an anti-inflammatory paste and Robaxin to his horses. Rigging a publicly exhibited contest in Pennsylvania is a first-degree misdemeanor. 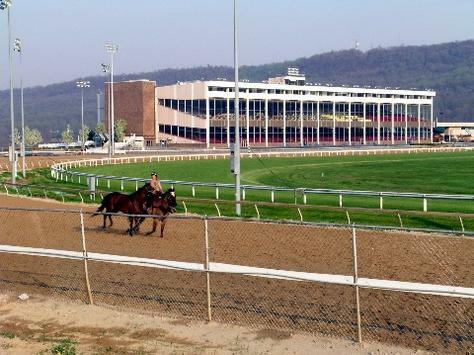 What began as a federal investigation by the FBI into corrupt practices at Penn National (among those charged as early as 2013 were a racing office employee, a clocker, and several trainers and veterinarians) has now been pushed into state court. During the only trial in federal court, in which trainer Murray Rojas was found guilty of misusing or misbranding equine medication, witnesses outlined how therapeutic medications were routinely given on race day in violation racing regulations. Records and invoices were altered to make it look like the medications were given at a time when permitted. Rojas, who was found not guilty of wire fraud, is awaiting sentencing. The FBI, working with state and local law enforcement and the Pennsylvania Racing Commission, secured billing records of veterinarians who cooperated in the investigation in exchange for guilty pleas. It is believed authorities are now going through those records and charging trainers with rigging publicly exhibited contests by illegally and knowingly having their horses treated with therapeutic medications in violation of regulations. Conner, 50, has been training since 1991 and has won 417 races from 3,185 starts, according to Equibase. Kravets, 63, first took out his trainer's license in 1977 and has won 3,575 races from 22,000 starts. Conner's last starter was on Sept. 28 and he currently has no horses entered to race. Kravets has two horses entered at Penn National on Oct. 18. George “Rusty” Albright was also charged with rigging a publicly exhibited contest and is scheduled for a preliminary hearing Oct. 18. This entry was posted in NL Article, The Biz and tagged Bruce M. Kravets, fbi, george r. albright, John D. Conner, murray rojas, Penn National arrests, stephanie beattie by Ray Paulick. Bookmark the permalink.